Trying to restore the iPhone backup but forgot the password? Without a doubt, the encrypt iTunes backup function protects your personal information and privacy when you synchronize your iOS device, but from time to time it bothers you. This password is stored using the algorithm PBKDF2 (RFC 2898) with 10,000 iterations and its recovery is very slow, but possible. To do this you just have to choose an iPhone backup password recovery tool and let it help you. In this article, we reviewed a bunch of iTunes password recovery software and pick the top 3 best iPhone backup password recovery software to help you recover password-protected iTunes backup with ease. iSunshare iTunes Password Genius is dedicated to find and restore the iTunes backup key for iPhone X, 8/8 Plus, 7/7 Plus, SE, 6s/6s Plus, 6/6 Plus, 5s/5c/5, 4S , iPad and iPod Touch. With its Pro version you can remove or recover iTunes backup password completely. The iPhone backup password recovery tool uses two common techniques for obtaining passwords: the use of a dictionary and brute force attacks. The first unlock mode is based on a dictionary with common passwords that the software is introduced in an automated way to check if any is used by the backup file. Brute force attacks work in a similar way, with the difference that you try combinations of numbers, letters and symbols until you find the right combination. Step 1. 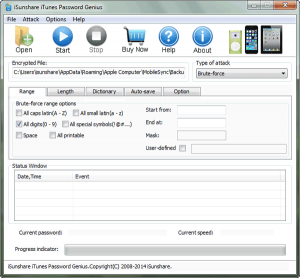 Download iSunshare iTunes Password Genius below and install it on your computer. Step 2. Launch the software, import an iPhone backup file you want to unlock. Step 3. Select a suitable attack type, click on Start and the software will start working. Once the software finishes it will show you the password and you can go to iTunes to access the files of the encrypted backups with that password. Tenorshare iBackupUnlocker is is a simple application to help you recover lost iTunes backup password for iOS devices including iPhone, iPad, and iPod. It is quite useful for recovering lost or deleted contacts, SMS messages, call history, photos, videos, audio files and other data that might otherwise be inaccessible. Daossoft iTunes Password Rescuer offers you easy and efficient ways to recover lost or forgotten iTunes backup password without any damage to your backup data, as well as enable access to iTunes backup file. You can just make it with 3 simple steps: Select Backup File > Select Password Attack Type > Begin Password Recovery. Step 1. 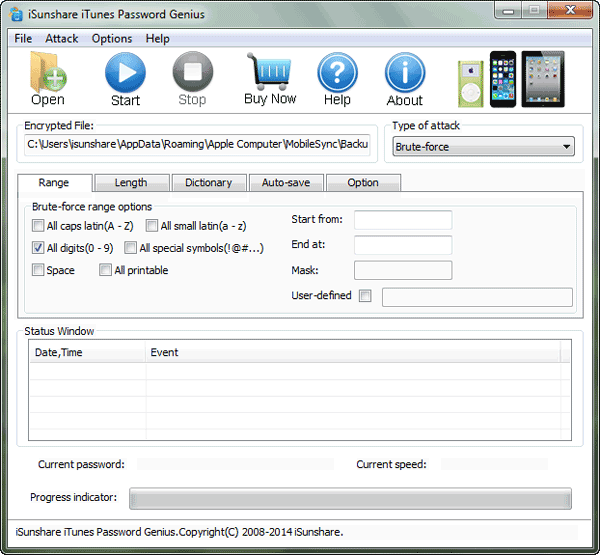 Download and install iTunes Password Genius on your PC. Step 2. Click Open button to add encrypted iTunes backup file. Step 4. 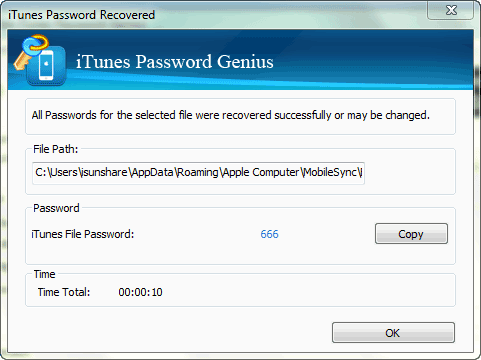 Recover iTunes backup file password.